Hard to believe that 100 years ago the Keweenaw Peninsula was in the midst of one of the most contentious upheavals in American labor history. Daily, the streets of the Copper Country were alive with the passion of striking workers. July 23, 1913, was the day the strike began, but 9 long months would transpire before the strike came to an end. Not only was the strike a long affair in regards to time, but it was also a massive affair in terms of geography. Spread out over more than 60 miles of rugged terrain, the copper strike encompassed three counties, tens of cities, and thousands of workers from Ontonagon County in the south, through all of Houghton County, and into Michigan's northern-most county, Keweenaw County. There was no disputing it, the strike was a massive and tumultuous affair. The image below is just one such capturing of this massive upheaval of worker sentiment in the Copper Country, and it also disputes the company-led notion that strikers were a wild bunch of hooligans and ruffians. Striking workers affiliated with the Western Federation of Miners and their families parade down Red Jacket Road . The strikers will soon be passing in front of Calumet and Hecla Mining Company's headquarters in their Sunday bests, no less. Image from Michigan Technological University's Copper Country Historical Collections. As can be seen in the image strike parades often consisted of mineworkers and their families dressed in Sunday bests and marching in an orderly fashion through the streets of mining controlled landscapes. 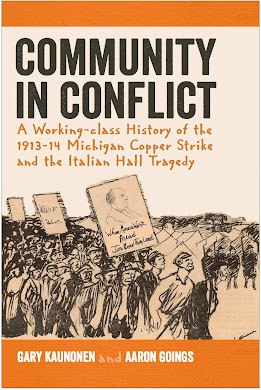 Wishing a thoughtful and meaningful appreciation to those who participated in the 1913-14 Michigan Copper Strike on this 100 year anniversary of one this epic historical event.